At 630 mm they are a little bit wider, which means better control, and more comfortable if you have wider shoulders. A rise of 40 mm instead of 60 mm. The middle part of the bar is not ovalized or curved downward, this means that it feels different when gripping it, but that it is easier to mount accessories like handlebar bags without having to make modifications. 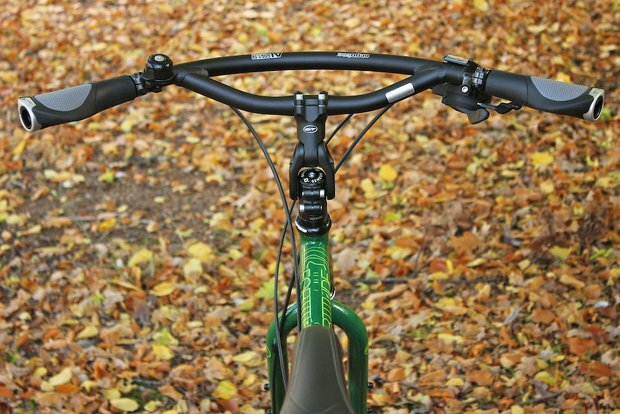 This handlebar is supposed to have a backsweep of 34 degrees opposed to the 18 degrees of the Boomerang. In practice the backsweep seems to be not all that much different. Ergotec Space handlebar on a bicycle with adjustable stem and Ergon GC1 grips. Just like the Boomerang the handlebar is made out of the same aluminum tubing which is thicker than most other handlebars I have seen. I thought for the Boomerang this was done because it is ovalized in the center, but for the Space is not the case. The extra material will add some extra strength to the handlebar. Ergon grips and plugs fit nicely in the handlebar, but some other plugs may have problems. Aside from extra grip space the handlebar also provide extra possibilities for carring luggage like a dry bag on the handlebar. We fit the Ortlieb Ultimate6 handlebar bag on it, which uses a system compactible with KlickFix and has a steel cable wrapped around the stem and handlebar to keep it in place. In this case the handlebar got in the way and required an extension that is also sold by Ortlieb for difficult handlebars. The handlebar bag was sagging, and tightening it further did not help. I resolved this with a tie wrap which supports the KlickFix-connector hanging from the handlebar. This has worked for four years now. Nice handlebar. The backsweep can be quite ergonomic. The handlebar looks a bit different than most. It is possible to attach a handlebar bag, but its not without issues. Good value for money. The handlebar has been used for over three years without issue.